Do you read the blog Young House Love? 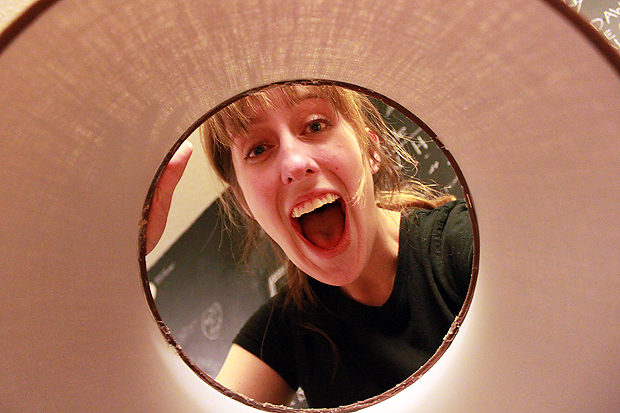 If you love DIY home renovations, you totally should! I've spent the better portion of the last several evenings browsing YHL's archives. 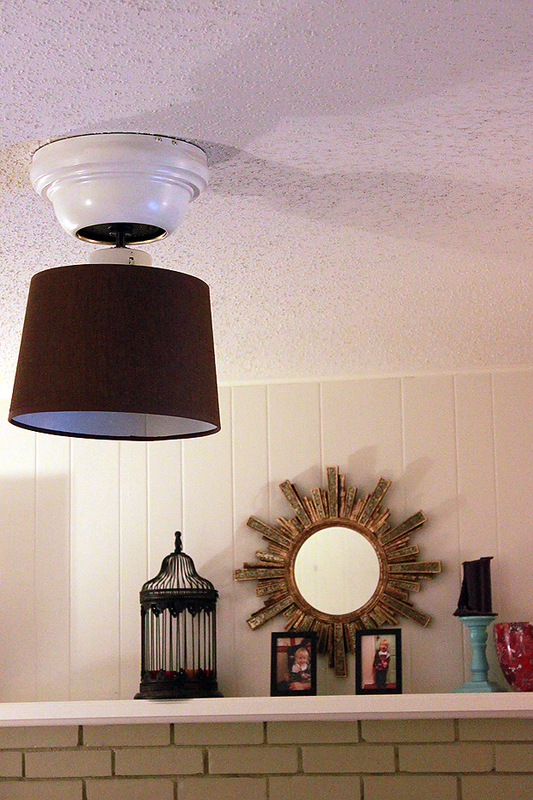 One post that was super duper inspiring was their simple makeover of a ceiling fan using a basic lamp shade. I tried very hard to follow their simple instructions, yet I somehow goofed it up. So Nathan and I had to improvise! So you know how lamp shades have a wires inside that are used to hold light bulbs? Well accidentally broke the wires, thus having a lovely (and useless) shade. 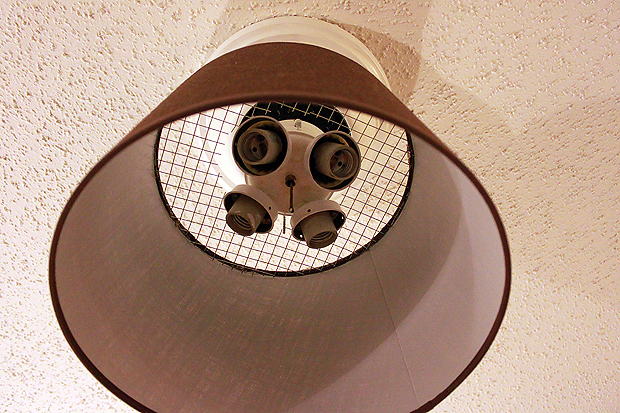 In order to attach a lampshade to a ceiling fan, the wire interface is important! So instead of getting sad (see my happy face through the lamp shade) Nathan and I got creative with a bit of chicken wire and paint! Here's an old photo of what the ceiling fan looked like before we began the project (please don't mind this old photo of the living room). Wow it has come along way! 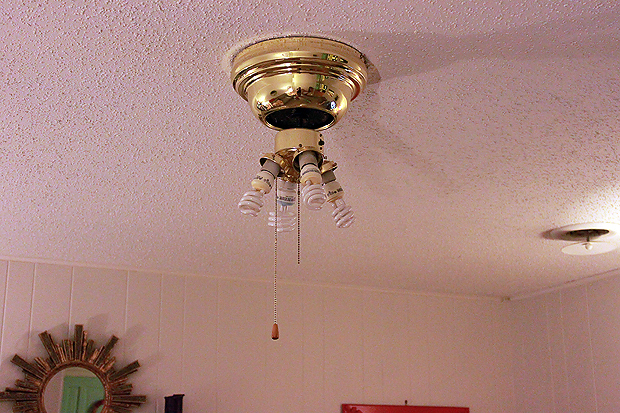 We removed the ceiling fan blades and glass light covers, were left with the lighting fixture. I painted the brass fixture with some paint left over from another house project. Thanks to the help of my hubster, we cut out a circle made of chickenwire to fit the top of the lampshade. 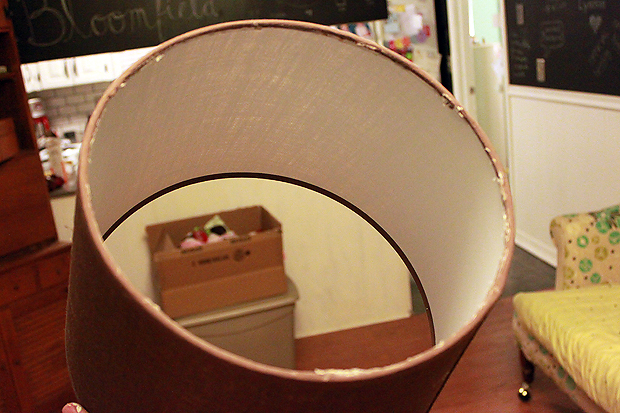 We then cut out a smaller opening within that wire circle to rest above the light fixture. 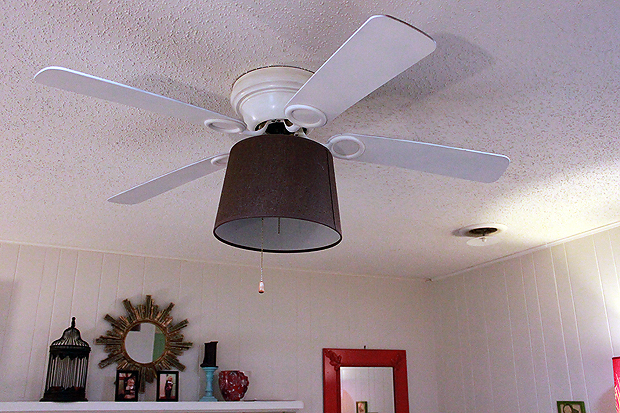 This method was the simplest way to attach the lampshade to the ceiling fan. It allowed light to escape through the top of the shade and required no glue, as the shade rests right against the chicken wire. Looking good, no? 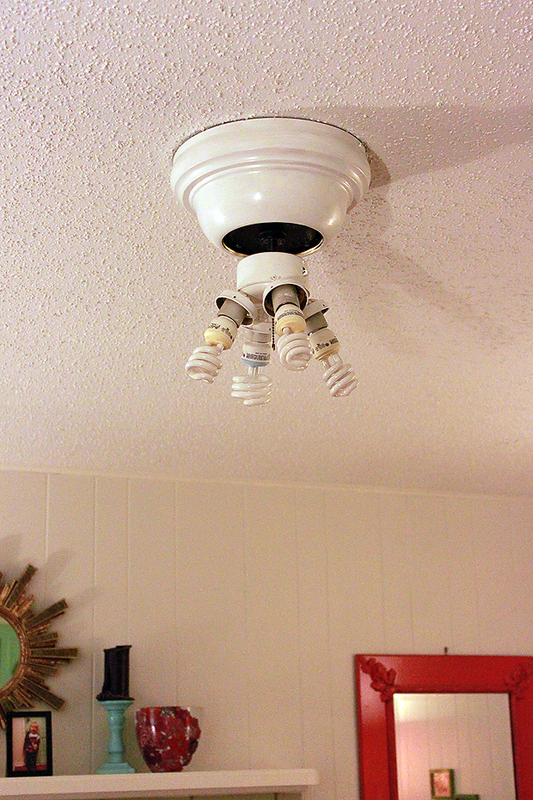 All that was left was to spray paint the old wood colored fan blades white and reattached them to the fixture. Voila! And let there be light! I genuinely love the transformation. The ceiling fan being white makes the walls seem taller, as the fixture visually disappears into the ceiling. The lampshade ads a modern touch to the room. I was so happy that we found a way to make the project work, even though I was clumbsy and broke the lighting fixture in the initial stages of the project. 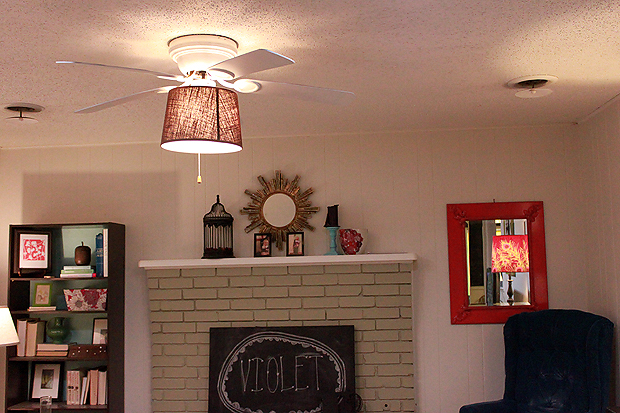 We reworked the old ugly fan and made it something quite snazzy! 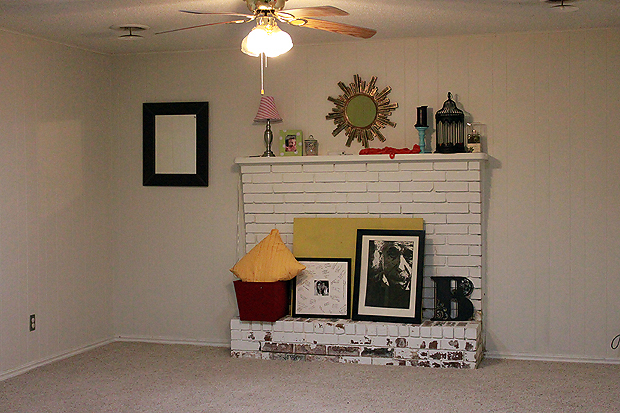 Be sure to check out Young House Love for your own home project inspiration!